1 portion (3 capsules) in the morning after waking up, 1 portion 30 minutes before training or 1 portion immediately after training. 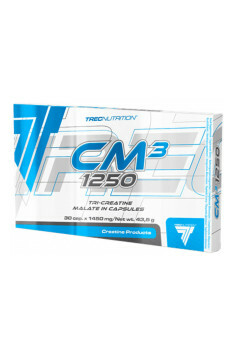 1 portion (3 capsules) in the morning after waking up, 1 portion between meals or 1 portion before sleep. When taking this formulation, it is recommended to maintain a high water intake, which should exceed 2 litres daily. If you do not follow this recommendation, you may experience symptoms of dehydration, e.g. headache. It is not reasonable to start with higher doses of the supplement, i.e. follow a “loading phase”. What is more, there is no scientific justification to take it in cycles. If an athlete decides to supplement with creatine, it is recommended to adjust the daily dosage accordingly, usually between 5 and 10 g.
Beta-alanine, which acts in synergy with creatine, is a perfect addition to this supplementation regime. These combination contributes to increasing training endurance and reducing pain during or after a workout. Protein supplement muscle mass building. Contains taurine and creatine.